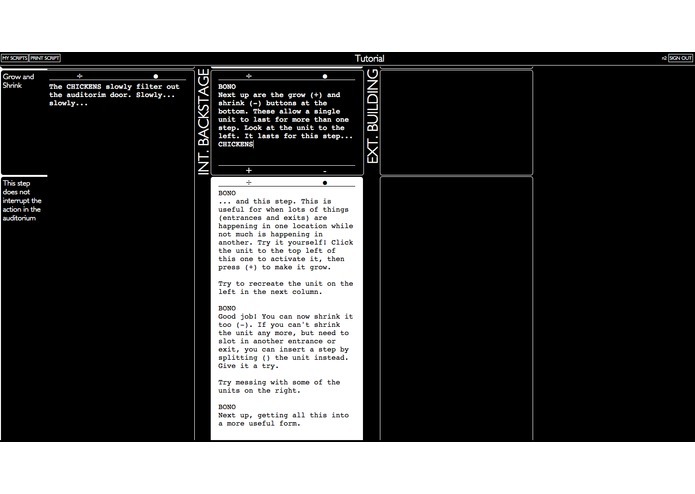 Synctory is a web tool for building multi-threaded narratives. Create complex interweaving narratives, giving your audience agency. Entity system prevents characters or other unique objects from being in two places at the same time. Files are saved online, allowing you to work on them from anywhere. 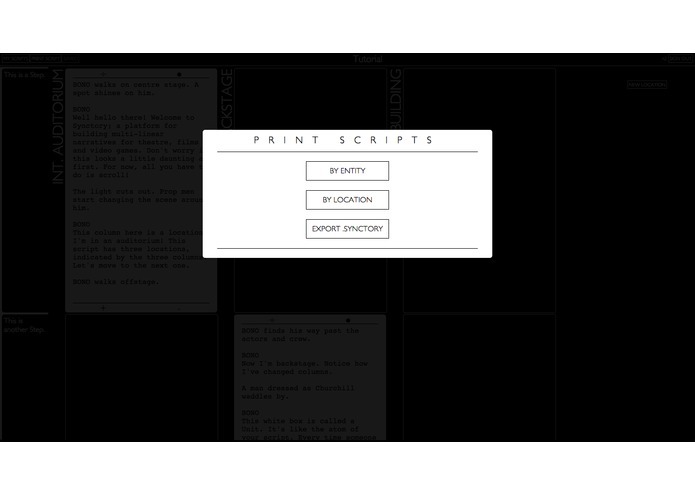 Uses Fountain to render printable bespoke scripts (for example, one type for an actor with just their scenes, another for the location director). Can be utilised in any medium that allows for a degree of interactivity. Traditional storytelling implies a passive audience. Increasingly we've seen different artistic mediums play with parallel story-lines to weave richer narrative tapestries, but they are still experienced linearly by the audience. 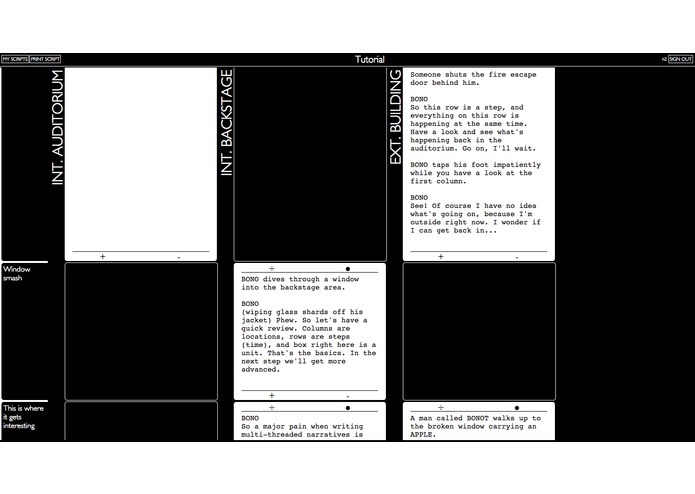 With new technologies we now have the capability to make multi-threaded narratives for large audiences. This is a vast unexplored area of storytelling potential. 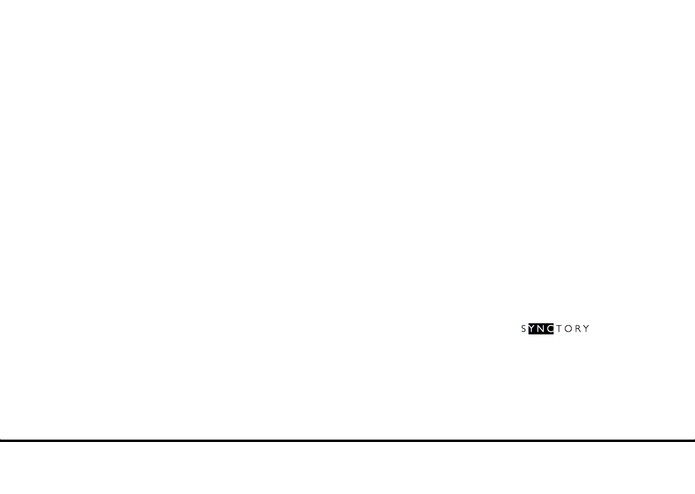 Synctory's output is something that looks very much like a screenplay. 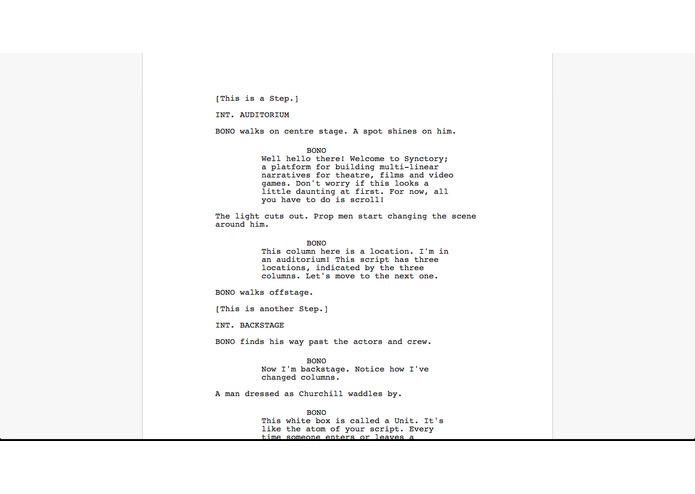 This can be used for the creation of immersive plays, interactive films or narrative-based video games. Steps - each step marks a point in time, synced across all Locations. An Entity cannot be in more than one Location in any one Step. Units - Units are the atoms of a Synctory script. It's where the dialog and actions live. Have a look at the video tutorial for more on how the system works. 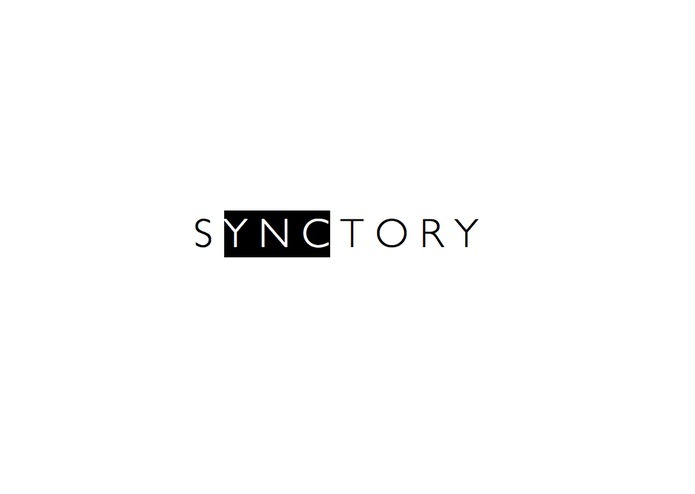 Synctory is currently available online at synctory.com. If you would like to run your own server or contribute to the project see the github page. 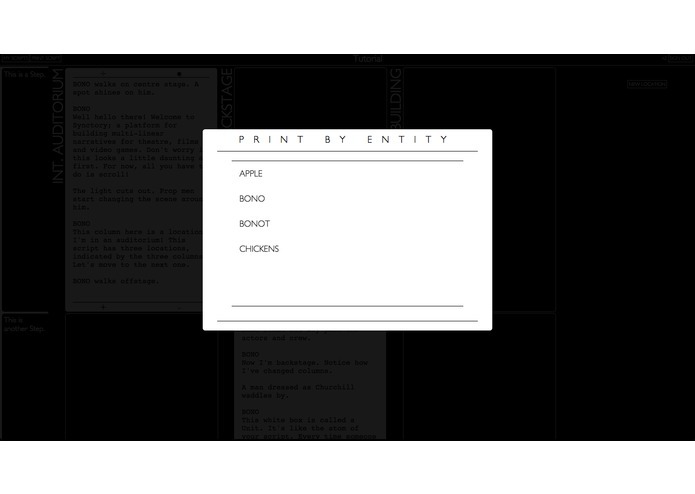 I created Synctory to ease the progress of my own experiments in interactive narratives. It is designed to be general enough for use in different mediums. It is also designed as a tool for creators, not consumers. 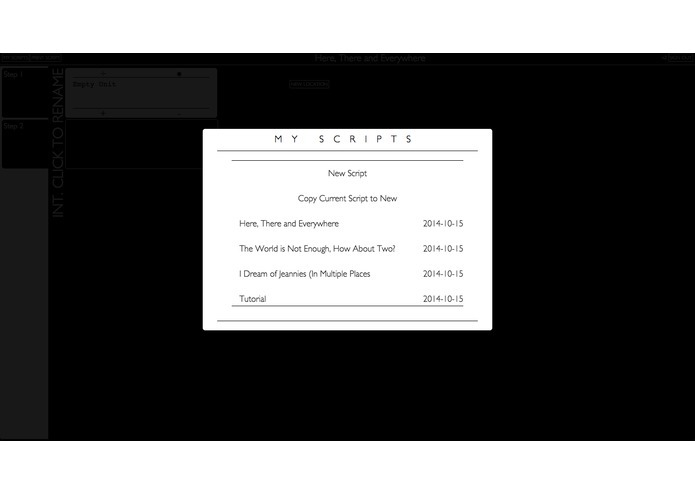 Users of Synctory are expected to use the tool to help them in their own mediums. For feature requests or contributions, please contact me directly (chrismcmath at gmail) or via the github page. Parallel Narrative - when more than one thing is happening at once, but the audience experiences them one after the other (A then B). Multi-threaded Narrative - when more than one thing is happening at once, and we have a degree of choice to which we experience (A or B). Linda Aronson has an alternative take on the terminology.